Part I. Kinetics and Mechanism of Hydrogenation and Hydrogenolytic Reactions. 1. Some problems of chemical kinetics in heterogeneous hydrogenation catalysis (S.L. Kiperman). 2. Synergy in catalytic reactions involving hydrogen: possible role of surface-mobile species (B.K. Hodnett, B. Delmon). 3. Adsorption and hydrogenation of carbonyl and related compounds on transition metal catalysts (K. Tanaka). 4. Hydrogenation of nitriles (J. Volf, J. Pašek). 5. Hydrogenolysis of C-C bonds on platinum-based bimetallic catalysts (F. Garin, L. Hilaire, G. Maire). 6. Hydrogenative denitrogenation of model compounds as related to the refining of liquid fuels (H. Schulz, M. Schon, N.M. Rahman). 7. Effect of catalyst composition on reaction networks in hydrodesulphurization (M. Zdra&zcaron;il, M. Kraus). Part II. Heterogeneous Hydrogenation Catalysts. New Aspects. 8. Carrier effect on hydrogenation properties of metals (G.M. Pajonk, S.J. Teichner). 9. Role of bimetallic catalysts in catalytic hydrogenation and hydrogenolysis (L. Guczi, Z. Schay). 10. Supported mono- and bimetallic catalysts in hydrocarbon conversions (J. Völter). 11. Supported bimetallic catalysts prepared by controlled surface reactions (J. Margitfalvi, S. Szabó, F. Nagy). 12. New supported metallic nickel systems (J.M. Marinas, J.M. Campelo, D. Luna). Part III. Advances in Homogeneous Hydrogenation. 13. Supported metal complexes as hydrogenation catalysts (Yu.I. Yermakov, L.N. Arzamaskova). 14. Supported asymmetric hydrogenation catalysts (J. Hetflejš). Part IV. Catalytic Hydrogenation Reactors and Technologies. 15. Liquid-phase hydrogenation: the role of mass and heat transfer in slurry reactors (G. Gut, O.M. Kut, F. Yuecelen, D. Wagner). 16. Application of fixed-bed reactors to liquid-phase hydrogenation (J. Hanika, V. Stan&ecaron;k). 17. Control of hydrogenation autoclaves (J. Horák). 18. Selective hydrogenation applied to the refining of petrochemical raw materials produced by steam cracking (M.L. Derrien). Subject Index. The collection of contributions in this volume presents the most up-to-date findings in catalytic hydrogenation. The individual chapters have been written by 36 top specialists each of whom has achieved a remarkable depth of coverage when dealing with his particular topic. 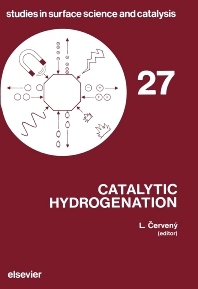 In addition to detailed treatment of the most recent problems connected with catalytic hydrogenations, the book also contains a number of previously unpublished results obtained either by the authors themselves or within the organizations to which they are affiliated. Because of its topical and original character, the book provides a wealth of information which will be invaluable not only to researchers and technicians dealing with hydrogenation, but also to all those concerned with homogeneous and heterogeneous catalysis, organic technology, petrochemistry and chemical engineering.